Cutthroat trout are native to western North America. The common name “cutthroat” refers to the distinctive coloration on the underside of the lower jaw. They are among the most diverse trout species, with the broadest historical range of North American stream welling trout. Cutthroat trout are found in fresh, brackish or saltwater in North America mostly west of the Rocky Mountains. Some populations inhabit small streams all their lives, while others live in large rivers and spawn in small streams or dwell in lakes and spawn in streams. A few coastal populations are anadromous, living primarily in the Pacific Ocean as adults and returning to fresh water to spawn. The ranges of the coastal and Yellowstone varieties are separated by a central area, which is occupied by rainbow trout. Inland forms of cutthroat trout also exist in western Alberta Canada, in headwaters of rivers. Depending on subspecies and habitat, the coloration of cutthroat trout can be golden, gray or greenish on the back. All populations have distinctive red, pink, or orange marks on the underside of the lower jaw, which helps in identification. 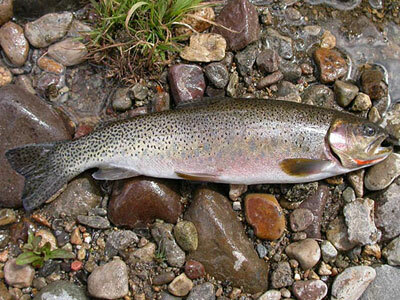 Cutthroat trout have a short, conical head with a somewhat rounded snout. They have a large mouth with well developed teeth on both jaws. Anadromous males develop a slight hooking of the mouth and elongated lower jaw during the breeding season. 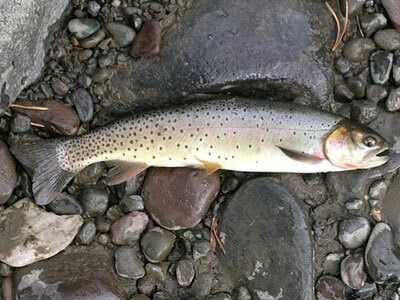 The coastal cutthroat trout is colored dark to olive-green with numerous black spots and may appear more blue with silvery sides. The interior cutthroat trout has a pattern of yellow-green with red on the sides of the head and front of the body and the belly. Size can vary widely among different populations and subspecies of cutthroat, with adults ranging from 6-40 inches in length, and weights ranging from less than 1 to over 15 pounds.